An 8km-long lake filled with sticky black tar is the most extreme example of the pollution that has built up around the desert town of Zhanaozen, in western Kazakhstan, since the supergiant Uzen field was discovered more than half a century ago. The lake was formed in the 1970s when an accident ruptured a pipeline, and the tar has been trapping birds and animals ever since. But now entrepreneur Bauyrzhan Zhanybekov wants to finally clean up the mess – and aims to sell the recovered oil. 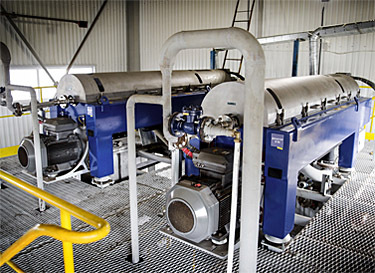 His technical solution is based around two decanter centrifuges that separate oil waste into water, solids and marketable crude. Zhanybekov can now process enough waste oil every week to fill an Olympic swimming pool. The solid residue, or “cake”, is undergoing tests and may be used to replace coal at a cement factory in the region. 1717: Prince Alexander Bekovich-Cherkassky documents oil near Atyrau, months before he is executed by the Khan of Khiva. 1899: Well drilled at Karashungul by the St Petersburg-based Emba-Caspiy strikes oil. 1910: Emba-Caspiy lists in London as Ural- Caspian Oil. 1911: Ural-Caspian makes major find at Dos¬sol. Bought out by Royal Dutch Shell. 1917–1920: Russian revolution and civil war. Oil regions not brought under Soviet control until February 1920. 1961: Discovery of the supergiant Uzen field renews Soviet interest. 1979: Discovery of the 6bn barrel Tengiz field. 1993: Independent Kazakhstan signs deal with Chevron to develop Tengiz. Kazakhstan signs deal with Shell, Statoil, Mobil, BP, Total and Agip to expore northern Caspian. 2000: Discovery of the giant Kashagan offshore field. 2013: Kashagan begins production, but produces for less than a month before it is shut down due to pipeline cracks leaking deadly hydrogen sulphide gas. 2016: Kashagan to restart production. Alfa Laval’s LYNX decanter centrifuges are the most hardwearing available, with replaceable parts made out of tungsten carbide. The bowl, conveyor and casing are made from the same steel used for nuclear reprocessing, and there is also the option of an extra coating of wear protection for use with extra-harsh and abrasive feeds. The decanter is built around a slender cylindrical bowl, which rotates at speeds of up to 3650rpm to produce a centrifugal force of up to 3574G. The decanter is 5.23m long, 1.325m in height and 1.190m wide, and can take about 500kg of waste oil, with a maximum flow rate of 100m3 per hour. Are you interested in how it works? Download the full story and find out..
We realized we could not only improve the quality, but increase the capacity many, many times." My first impression when I saw this fifteen years ago was 'how beautiful'. The nature is amazing. I was shocked at how it had been polluted."